I realized that I have been holding off on doing fashion posts because I was a tad bit nervous. Food and home topics are more of a comfort area for than fashion. Judging one on their house and food choices doesn’t bother me as much as if judging on my fashion style. I would be much more upset if you didn’t like my outfit than if you didn’t like the way I organize under my sink. After talking with one of my good friends, she gave me a pep talk and made me realize that some are going to like it an others aren’t. She also suggested that I just crop my head out of pictures if I’m having an “ugly” day. The other day was the an annual friend festivities where all my girlfriends always dress to impress. I choose to wear this peplum top and color block skirt. I am in totally love of this peplum top that I scores at NY& Co. a few weeks back. It is on super sale right now in other colors. I used one of their city cash deals and got it for the price it is going for on sale (~$23.00). If I ever shop at that store without one of the city cash coupons, it would be the day I failed as frugal shopper. The gray skirt was a TJ Maxx find last week. I scored it for $26.99 and it probably will be a staple in my closet for a few years. I actually ended up rolling it once to make it a bit shorter. The top was able to cover the roll. It is a perfect option for work when not rolled down to wear with a sweater. The booties are my most recent purchase from Macy’s. 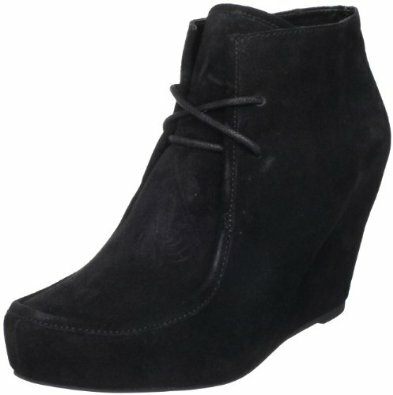 I love that they are suede and have the hidden platform. They are super comfy and the bottoms are rubber, which make them perfect for wearing to work. I’ve wore then to almost everyday since I bought them. The price online says $79.99, but they were on sale at the store and I was able to use a Macy’s coupon. I ended up having to have them shipped to my house because they didn’t have my exact size at the store. I ordered them Saturday (free shipping) and got them on Tuesday afternoon. I guess I bought them blind size wise, but they ended up fitting perfectly. Pair the top, skirt, and booties, with a nice shinny pair of black tights. I was going to go a bit bold and wear a pair or ox-blood colored tights, but I wasn’t feeling it when I got dressed. I would have also added an necklace of some sort. Maybe a bib or peter pan collar necklace.